During summers, there is not another activity that kids love comes close to pool and outdoor fun. Pool time is not only for fun though, it is good for them health-wise as well. Being a mom myself, I encourage you to let little kids play outdoors, in pools as much as you can. These days they are surrounded by technology. There is little hope that they’ll be physically active. In order to ensure that your kids love outdoors, make sure you check out these five amazing swimming pools. It is almost impossible to resist such a cute giraffe! I cannot even begin to do it. 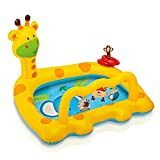 This pool is flavored by a brightly colored yellow giraffe. This kind of item looks great in any back garden. The pool comes with two inflatable noise makers and two inflatable rings. There is also a repair patch. Another beauty by Intex. These beige colored pool is specially designed for kids from ages of one to three. There is a default built-in sun shade that will gave respite to your baby from the sun. Like most high-end pools, the floor is also inflatable to provide extra comfort. This brilliant blue pool boat seat will provide a fun and safe way for your baby to enjoy him or herself in the water. There is shade to protect from sun. There is a steering wheel that actually rotates and there is a cute beeping horn in the middle. There are many add-ons such as a hole for baby to sit down, that can be removed if not needed. 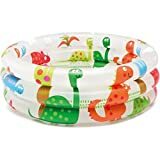 This Intex ring shaped baby pool is special for two reasons; it is themed by dinosaur. I don’t know why but I have this strange fascination with dinosaurs. The other reason is that it is made out of 100% eco-friendly PVC. It can contain up to 9 gallons of water. A free repair patch is also included. Let’s make our final entry a bit premium. This beauty is completely irresistible. There are two sections connected by a slide. The bright blue, red and yellow colors make it a compelling spectacle. A ball roller game and a toss ball game are included along with six play balls. The pool holds a whopping 77 gallons of water.